The review team from On Course Profits have a recommended service today, but first I want to tell you about a betting bot with limited places. The Mystery Horse Bot 2016 is an all updated version of the original Mystery Horse Bot that has been created for Sportsworld Publishing by our own correspondent Malcolm Pett and his Sporting Bots team. The bot made 300 points profit last year, all on auto pilot. 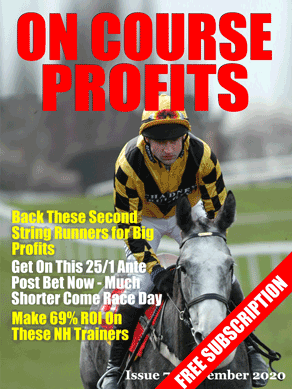 Users just have to start the bot and leave it running during racing and any value bets will be placed. If you go away for a few days, just leave your PC on with the bot running and when you get back there will probably be profit waiting for you. Sportsworld are only releasing 20 bots per week and the new release comes on a Monday morning. The Trial: Our 2 month trial has now come to an end unfortunately and we say unfortunately as this is one service which we have been very happy to review. Our final results at the end of the trial have shown 23 winning bets from the 83 selections received and more pleasing there has been a healthy profit of 37 points. For some the return of 13.50% may feel a little low but for us this is a positive and more importantly a realistic rate of return which can be achieved and comes with a strong level of consistency. Cost: £7.00 for the first 7 days then £90.00 every 90 days. The Trial: Another trial which has come to an end is that of Lay Bet Profits. Our final month here has in fairness recovered almost all of the previous losses incurred during our previous trial months. The problem is though that this is almost too little too late as after a 3 month period, and even BEFORE taking in to account the membership subscriptions we will have only just broken even. The service needs to improve its results further if additional profits are to be achieved.